Water ATMs or Water vending machines have become the next big thing to provide clean, drinking water especially in rural India. It is an innovative concept in the field of water treatment and can include microbial disinfection along with a water cooling facility. The Water ATM can dispense purified and cold water against an affordable cost. It is also a reminder that if we do not respect and take care of our natural resources, the future is going to be as mechanical as this. The above Water ATM has been installed in the state of Rajasthan by Cairn Indian in collaboration with the Government of Rajasthan. Being a desert state, with erratic rainfall, people are forced to walk long distances to procure water, which is of a highly questionable quality and generally does not meet WHO defined norms. 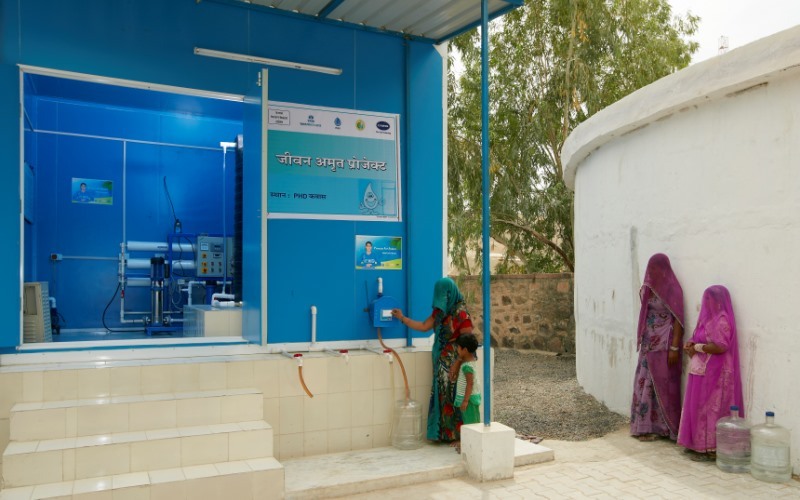 To address the acute water shortage and provide access to clean and safe drinking water, Cairn India has initiated a Jeevan Amrit pilot project to ensure clean and safe drinking water through the establishment of Water ATW (Any Time Water) kiosks in Rajasthan and also in parts of Gujarat and Andhra Pradesh. Cairn currently operates 44 ATW kiosks in Rajasthan and Gujarat, which have a best-in-class utilization and is establishing ~75 more. Communities are provided with pre-paid smart cards with which they can access water at their convenience, in a manner similar to the access provided by bank ATM machines.